My friend, author and blogger, Tim Challies, posted an article regarding Christian bookstores recently that I took exception to. Does that change how I feel about Tim? Not at all! I concur with some of his points and disagree with others. Check out Tim's post here. Fellow pilgrims who regularly read Pilgrim Scribblings will already know my perspective on Christian bookstores. 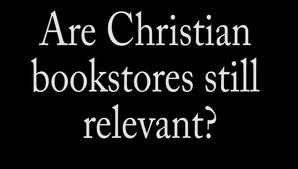 Having owned a Christian bookstore for 15 years...before Amazon, Chapters and CBD were a factor, I have strong opinions about "Christian" bookstores. It was a challenge to satisfy customers from varying denominational perspectives. Some of the charismatic books that customers wanted me to stock were downright BAD. Customers often complained that we didn't have enough stock. They seemed to expect our small store to carry every "Christian" title on the publishers' backlists. Not possible! No chance! It was always disappointing that a large segment of the local and area Christian population rarely frequented our store. I could sit in church and count on two hands the members of our congregation who faithfully dropped in to the store. Looking back, I thank God that friendships were forged within those walls that will last a lifetime. One of my best friends came into the store the day after he was converted to Christ and is still thankful that we were there. Customers were led to a saving faith in Christ in our store. Struggling Christians were prayed for and encouraged. That doesn't happen with Amazon and Chapters mail order purchases. Another question begs to be answered. "Am I a more faithful steward of God's resources if I purchase online at a discounted price rather than supporting our local Christian bookseller and paying full price? I struggle to find an answer. I just don't know. So the battle rages on. While our community has a Christian bookstore I will be a faithful customer. I'm blessed when I pay the store a visit. I don't buy "gospel garbage", "Jesus junk" or "holy hardware" but I try to be an encouragement to the owner and other customers who I meet in the store. Choose what you want to do but please don't complain when your local Christian bookstore closes its doors...forever. Note: Our local Christian bookstore is Emmaus Family Books located in the Market Plaza across from the marina on Little Lake. Drop in and tell Jim Rose that I sent you!